It is not possible to reform or reconfigure the genocidal State system in the island through so-called consensus engagements with the Colombo Establishment either internally or externally, commented a leading civil official in Batticaloa revealing details of a new Sinhala colonisation scheme silently spearheaded by the Mahaweli Ministry of SL President Maithiripala Sirisena. “As far as Tamils are concerned, any consensus programme coming from outside towards the SL State should be viewed by Tamils as a consensus forged among the Establishments for continued strutural genocide against the nation of Eezham Tamils,” the official, who would be risking the SLAS job if publicly identified, told TamilNet. The official revealed how Mahaweli ‘Development’ Ministry is now reviving a colonisation scheme which was originally proposed under Rajapaksa regime in 2008 and later abandoned in 2010. 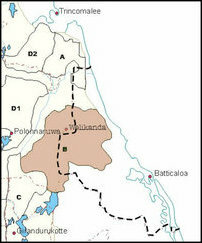 265 Sinhala settlers from Colombo and Kandy are going to receive 50 acres of lands per settler family at Meeraa'ndave'li in Vadamunai, which comes under Koa'ra'lap-pattu South (Kiraan) administrative division of Batticaloa district, the official said showing documentary evidence to TamilNet. Occupying Colombo is alienating these lands to Sinhala settlers through Mahaweli B System. 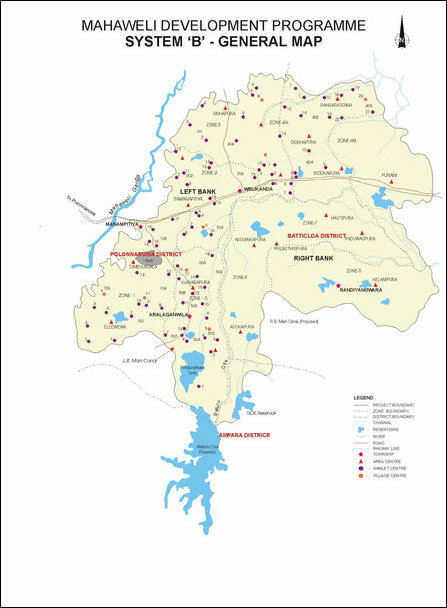 After seizing the territory of Eezham Tamils from the LTTE in 2007, the Colombo-based SL State system was at full swing in seizing the lands and demarcating these as State Lands. The lands were essential for the livelihood of Tamil residents for their farming activities. The three basic sources for the livelihood of the people in Batticaloa are agriculture, cattle farming and fishing. After 2009, Tamil people wanted to resettle in their native villages from which they were chased out during the times of war by the so-called ‘home guards’ paramilitary operated by the occupying Sinhala military. The provincial councils continue to be powerless and the SL military functions as the main force threatening any civil mobilisation against the so-called ‘central’ institutions of the Colombo-based system. The 13th Amendment was also placing the administration of so-called State Lands at the hands of the unitary system. Any ‘inter provincial’ development programme such as the Mahaweli Scheme, would be following ‘national ethnic ratio’ in the distribution of lands, the senior SLAS officer said. It is this provision, which is now being cited by the Mahaweli officials to alienate lands to 256 Sinhala settlers from Kandy and Colombo in the heartland of Tamils in Batticaloa. On “Inter-Provincial Irrigation and Land Development Projects”, the 13th Amendment places the decision at the hands of Government of Sri Lanka by stating that when the “command area falls within two or more Provinces such as the Mahaweli Development Project”. The SLAS official further said the land allotment was not even taking place according to the ‘national ratio’, which was not acceptable to the sovereignty and territorial integrity concerns of the traditional homeland of Eezham Tamils. Even according to the so-called ‘national ratio’, ethnic Sinhala-Buddhists constitute only 69%. But, when it comes to Mahaweli system 96% of the beneficiaries have been Sinhalese. Tamils constitute 16% (Tamils from North-East 12% and Up-country Tamils 4%). 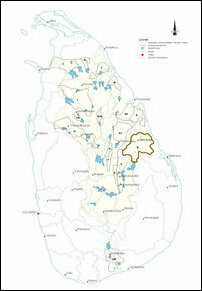 Tamil-speaking Muslims stand for 8% of the ethnic ratio, but they have only received 2.5% in Mahaweli scheme so-far. 16% of Tamils have only received 1.5%, the official further said. “During the times of the armed struggle and the de-facto Tamil Eelam administration, there was an internal pressure against SL unitary state mechanism. We were in practice consulting with the Tigers on the administrative affairs and were used to co-exist with both the systems. The existence of the de-facto situation also created the condition for negotiations with international mediation. But, after the 2009 genocidal onslaught, this internal pressure and its external dimension is gone. The external dimension has also become more Colombo-centric and a full-scale structural genocide is being taken forward,” the official commented on condition of anonymity. The external dimension should be clearly understood, interpreted and acted upon by the Tamil diaspora, the official further said.